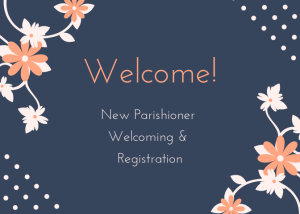 The next New Parishioner Welcoming and Registration is Sunday, April 28, 2019 at 12:15 pm in the Parish Hall. Please click here for a registration form and bring it with you on the 28th. Can’t make the Welcoming? Please complete a registration form and return it to the Parish Office. Welcome home!